Tinni: You are stating the obvious. A: I mean, it’s really raining, and raining hard. T: A good thing, I think. T: Rain makes the grass grow faster. This means that there’s more of it for all of us. A: Do you wish that there were fewer of you? T: No. Raudi and Hrimmi are my gals. But I do wish that there was more grass in the yard for us all. A: What do you think about the new hay? T: It’s good stuff, really good stuff. You should throw open all the hay closet doors and let us have at it. You know, we do know how to regulate our intake. And hay isn’t like grain. We can’t get stick on it. A: Not even the new first cutting? T: Let us have at it. There’s only one way to find out. T: What do you think is going to happen? Our bellies will burst? A: Yeah, and I will have to clean up the mess. T: What a way to go. A: Do you ever think about anything besides food? A: Well then, what else do you think about? T: Lately I’ve been thinking about being Pete’s number one riding horse. I’m enjoying my new role. He’s a great rider, very calm, very relaxed. He has a good seat and a fairly light hand, though not as light as yours. And he never, ever pushes me too hard. He just has a really good sense as to what I’m capable of doing. And you. who used to be my number one rider, are now getting to spend more time on Raudi. A: What does Raudi think of all this? T: Oh, she’s happy too. She was okay with you riding me, but she is glad that you are spending more time riding her. A: What does she think about our taking jumping lessons? T: She’s really enjoying this. However, she would prefer you make the lessons short. This way she can give the lessons her all. The other night after she got home and she went on and on about how she jumped seven jumps in a row. I think she was very proud of herself. And she was pleased that you were proud of her. A: And what do you think about Hrimmi? I’ve noticed that you two spend a lot of time together, eating and social grooming one another. T: She’s a sweet little down to earth filly – doesn’t have Raudi’s uppity attitude. She’s also young, and doesn’t have much life experience. She enjoys going out with us all. I’ve told her a few times that in two-three years’ time she’ll be Pete’s number one riding horse. A: How will you feel about this? T: Alys, I’m 25 years old. I’ve never felt better. But I am getting up there in years. I suspect that by the time Hrimmi is five that I’ll be ready for semi-retirement. We’ll then trade places. Pete will ride Hrimmi and pony me. 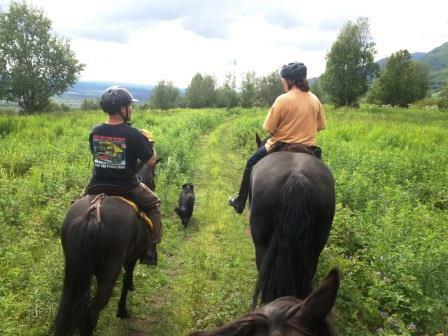 A: Are you up for doing the upcoming competitive trail ride? T: Yes. I don’t want to do the two-day event. But the one day event would suit me just fine. I’d get to spend time with my other Icelandic buddies, and after, relax. A: What will you and your Icelandic buddies talk about? T: We’ll mainly talk about the big horses, and how they do dumb things. T: Jump around and waste energy. They also tend to see things that aren’t there. A: Is there anything you’d like around here to be done differently? T: More grass, more hay. That’s all.